Healthcare Risk Control (HRC) relies on three critical disciplines, organic parts of an overlying system, namely healthcare in general. Communication, Patient Safety, and Patient Experience; each directly affects the other and are interactive and cohesive to the next. For a positive impact on those disciplines, healthcare organizations must realize that in the midst of the much faster-paced healing environment of modern healthcare, human-factor plays a critical role in the lack of success for HRC initiatives. In this series, we will discuss data from the report from the ECRI Institute, SUPPLEMENT A September 2009, Healthcare Risk Control. Then we will determine why embracing technology that augments the human-factor is the only way to ‘move the needle’ on outcomes and to have sustainable results with initiatives that we cannot ‘get off the ground’ or are yielding minimal results. According to the ECRI report, the Joint Commission has identified communication as the cause of 70% of reported sentinel events; even above staff oriented training, patient assessment, and staffing. Much effort has gone into improving communication because of this issue. These initiatives among others are constantly being scrutinized and refined by The Joint Commission. But how can technology help? In most cases, adding communication technology has mixed outcomes because most solutions are in existence to assist the staff but usually is not what patients want. How so? EHRs help hospitals have more accurate workflows and ensure that whoever you are and wherever you may be in the hospital, you have access to the patient’s record. Many initiatives are in place to include the patient in their care, completing the continuum of care cycle. It makes perfect sense. However, the tool that the patient gets is a tablet to access their record or a page on their in-room TV that the patient navigates to via a menu. How could this be a problem? In their Statistical Brief #180, The Healthcare Cost and Utilization Project (HCUP) reported an overview of statistics for all hospital stays in the US in 2012. One of the outliers in the report was that the highest number of hospitalizations, length of stay, and mean cost all landed in the 65-84-year-old age range. How can this be a problem when attempting to fix the lack of patient engagement with patient interactive technologies? 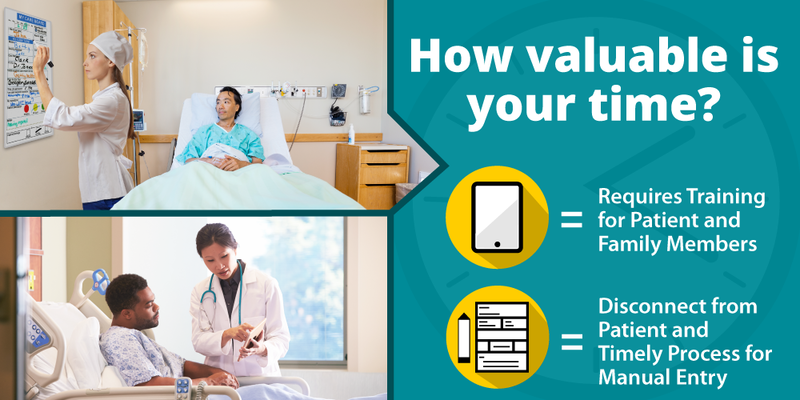 These are strong indicators as to how tablet-based communication tools and other patient interactive technologies such as TV-based systems will fair among the hospital’s population. The investment of these tools will benefit only about half of the patients. What do patients want with communication? They want a human to tell them that everything will be OK and that they will take good care of them. While these technologies are employed, it is common for essential clinical information to be written by hand on a dry-erase board in the patient’s room. The time used by staff is in essence not used for what the patient wants. Instead, the time goes into teaching the patient how to use a device and to handwrite messages on a dry erase board. We can see how these sorts of technologies can break down communication initiatives rather than build them up. In contrast, automating as many workflows for the patient can give the patient and the staff what they want. For example, digital patient room whiteboards are becoming popular because they can connect to the EHR and other systems to display the critical information that the patient desires and that the staff requires without either of them lifting a finger. These solutions are always on so if they are up at night and they want to get an update they can. The results? 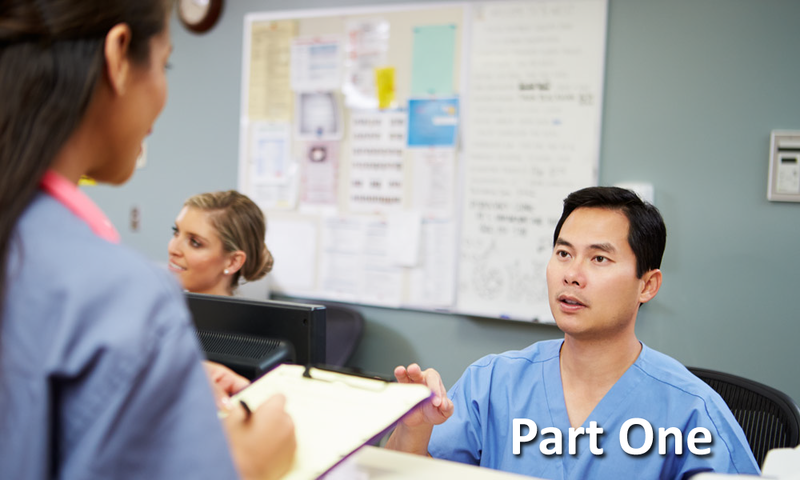 Staff spends their valuable time talking to the patient during their purposeful round, assessing the patient’s current condition and documenting any changes to their health record. Then the digital patient room whiteboard does the rest of the work. When this strategy has been implemented, hospitals have see an increase in their Nurse Communication achievements points by over seven points with sustainable outcomes. Additionally, patients are better acquainted with the nurses and mention them by name in HCAHPS surveys. Additionally, digital patient room whiteboards allow patients to read their clinical information in their own language, see pictures of those taking care of them and to understand their care with simplified language. In part two of this series, we will discuss patient safety, the challenges that healthcare faces with keeping their patients safe including medical errors and falls. Finally, we will discuss the technology that is in use currently to remedy these issues and how it can help. To learn more about MEDI+SIGN Digital Patient Room Whiteboards, how they prove to be among the most secure devices in the hospital and how they are designed to counteract cyber attacks, please visit us at www.medisigndisplays.com. Audrey J. Weiss, Ph.D. and Anne Elixhauser, Ph.D.
MEDI+SIGN is a registered trademarks of Specialized Communications, Inc. Other company and product names may be trademarks of their respective owners.